WRIGLEYVILLE — The Cubs have released renderings of proposed changes to Wrigley Field and the surrounding neighborhood, including the controversial Jumbotron in left field that rooftop owners fear will block their views. The photos, which went public early Wednesday, show the proposed 6,000-square-foot video screen in left field. In right field, a mock "Wrigley Field" ad shows how a proposed 1,000-square-foot ad would look. The team also publicly debuted renderings of the proposed hotel on the McDonald's lot across Clark Street, the expanded, two-story Captain Morgan Club at Sheffield Avenue and Addison Street, and the open-air plaza on the so-called Triangle Property on the west side of the ballpark. Drawings show retail space on the ground floor of the hotel and ads on the side of the building. Other buildings in the plaza would also have ads on them. Overall, the team proposed 35,000-square-feet worth of advertisements on the buildings. The Cubs have been showing the renderings to neighborhood groups in private meetings for weeks, including ones where Beth Murphy, owner of Murphy's Bleachers, was present. But Murphy and neighborhood groups have expressed frustration that the drawings shown to the community have omitted the images of the more contentious Jumbotron and signs. The hotel and plaza renderings look and sound pleasant, sources at the meetings have said, but more work needs to be done on the overall plan, including looking at signs, reducing the number of night games and addressing potential traffic problems. "I'd be real interested in seeing specifics," Murphy said at an event last month. "We’ve seen parts of the hotel, and some of the things that are less controversial." Rooftops spokesman Ryan McLaughlin said as of Tuesday evening, rooftop owners still had not seen the Cubs' new renderings, but that Murphy would be ready to comment Wednesday morning after Cubs Chairman Tom Ricketts speaks at the City Club of Chicago. Previously, rooftop owners have threatened to sue if their views are blocked. Though the team reached a framework agreement on the $500 million plan with City Hall and Ald. Tom Tunney (44th) a couple of weeks ago, all parties have emphasized the project needs to go through the community approval process before a plan is finalized. An oft-repeated frustration at community meetings is that the neighborhood residents are the last to hear details of the project. The team's community representatives have responded to accusations in meetings by saying most of the renderings and proposals are given to community groups first, including renovation plans. The next couple of months may be especially busy for team community representatives — the Cubs told Crain's Chicago Business that it plans to file the planned development application Wednesday and would like to present to the city for final approval process starting in early June. Four of Lakeview's nine neighborhood groups would be allowed input. The Cubs' first test after the framework agreement was announced was a presentation to Southport Neighbors on April 22, which was closed to media. Neighbor reactions were mixed, according to sources present. People expressed hesitation primarily on the height of the 91-foot hotel and the number of night games, they said. 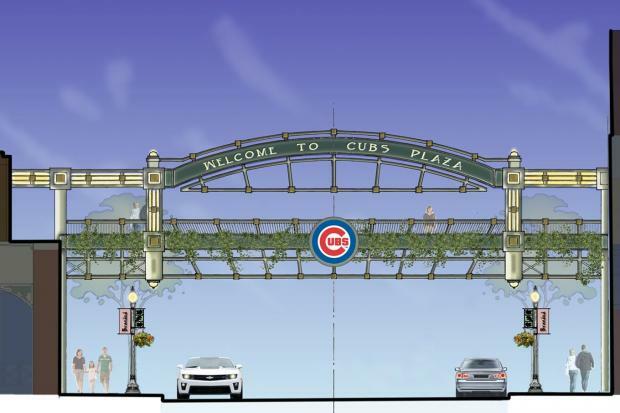 The team's proposal to hold at least 40 night games, up from 27, is too much, and letting the Cubs build the hotel at the proposed height would "set a precedent for every other business on Clark Street," Southport Neighbors president Jill Peters wrote in a letter to community members. "We want the Cubs to scale down the hotel," she wrote in bolded text.